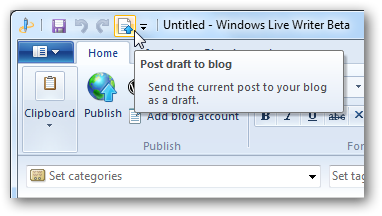 Have you had trouble finding the option to post a draft to your blog in the new Windows Live Writer beta? Here’s a trick that will let you post a draft post to your blog in one click. If you use Live Writer as the primary way you write for your blog, chances are you post draft articles to your blog fairly frequently. Face it; even on our best days, most of us make a mistake, so it’s often best to post a draft, then read over it later and make sure it sounds good before publishing it to the world. This used to be quite easy; in the old version of Live Writer, you could click a down arrow beside the Save draft button in the toolbar, and select Post draft to blog. Two clicks. 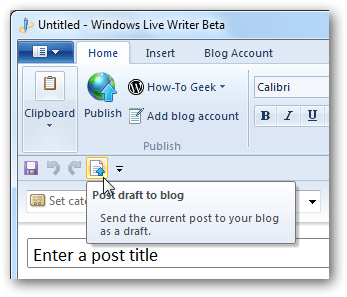 The new Windows Live Writer beta, unfortunately, makes it harder. There’s no Post draft to blog button visible on the main ribbon toolbar. Instead, you have to open the File menu, select the arrow beside save, and then click Post draft to blog. If you prefer keyboard shortcuts, you could press Alt+F+V+B, but that’s a crazily long shortcut to press every time. Thankfully, all application with the Ribbon interface make it easy to put frequently used commands in an easily accessible Quick Access Toolbar in the left side of the window border. Simply find the command you want in the ribbon or File menu, right-click it, and select Add to Quick Access Toolbar. Now you can post a draft post to your blog in one click! That’s even better than the old version. If you’re not fond of the buttons being on the top of the window, right-click the toolbar and select Show Quick Access Toolbar below the Ribbon. Now your post draft button is right above your article title, so it’s quick and easy to post the draft. Although the ribbon interface is a nice addition to Live Writer, it can be annoying to have to open the File menu every time you want to post an article draft to your blog. With this simple trick, however, you can customize Live Writer just like you want. In fact, now it takes less clicks to post a draft to your blog; with the old edition of Live Writer, you had to click twice to post a draft. If there’s any other tool you’d like easier access to in Live Writer, note that you can add anything in Live Writer to the Quick Access Toolbar this way. For more information about the Windows Live Writer Beta, check out our Screenshot Tour of the new Windows Live Essentials Beta.